The Petoskey Area Visitors Bureau’s golfing guide helps to navigate a playing paradise in northern Michigan. Arthur Hills, ASGCA Fellow, well-known golf course architect and chairman emeritus of Hills-Forrest-Smith Golf Course Architects, deflected praise for his work on The Arthur Hills Course at Boyne Highlands Resort in Harbor Springs—particularly when the subject of the tee shot from the 13th hole was addressed as his golf group stood on the tee. 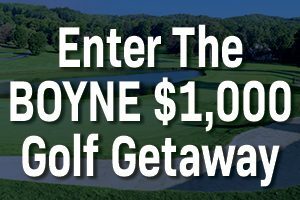 Nature blessed Boyne Highlands and the entire, popular Petoskey region with a bounty of breathtaking places; golf courses included. At No. 13 on The Hills course the view remains today of an endless sky and dramatic rolling terrain. Just a few miles away, an eye-pleasing panorama of Lake Michigan overloads the senses on The Links course at Bay Harbor Golf Club. Close by, Little Traverse Bay Golf Club seems perfectly named as a golfer’s very first tee shot climbs toward the clouds and the bay beyond. Playing golf in this Petoskey region is seemingly a series of tee shots into breathtaking views. Big-name golf course architects, a choice of championship quality courses, luxury, and even some welcome affordability help define golf in the area. The beauty steals the show from that 13th hole tee on The Hills course, and the rolling forest land at Chestnut Valley Golf Course in Harbor Springs, to the fly-fishing steam at Hidden River Golf & Casting Club in Brutus, and the untouched by time experience designed by Willie Watson over 90 years ago at Belvedere Golf Club in Charlevoix. The Petoskey golf market has a significant public access segment dominated by the Boyne Resorts—Bay Harbor, Boyne Highlands, Boyne Mountain and Crooked Tree—but upon closer look, others come into view, such as: Chestnut Valley, Little Traverse Bay Golf Club, Charlevoix Country Club, A-Ga-Ming Golf Resort—Sundance, Torch, and Antrim Dells courses—Dunmaglas Golf Course, Hidden River Golf & Casting Club, Belvedere, and more.